Sea Sonic has only recently introduced its Snow Silent Series to provide customers with an attractive choice for unique, lighter color builds and it soon became popular. 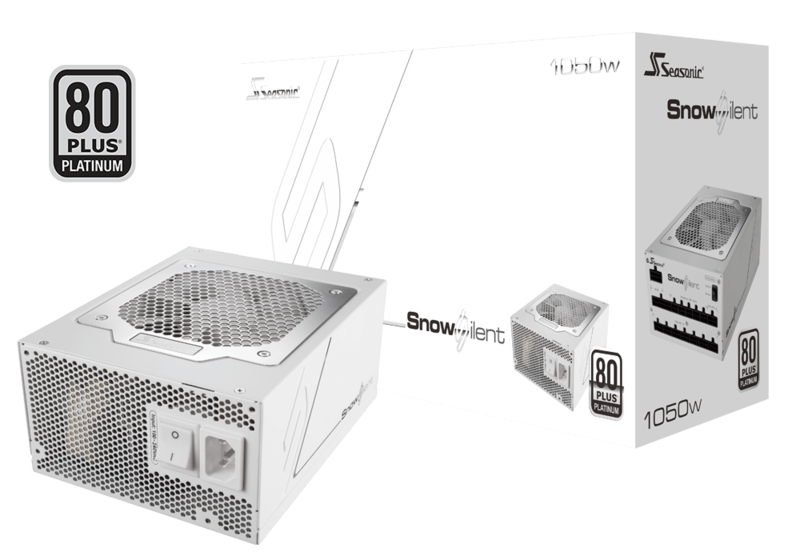 The Snow Silent units are not only stylish and sleek but also are of high quality and include the most advanced functions that are characteristic of other members of the Seasonic Platinum products. These units are advanced silent performers with Seasonic’s upgraded S3FC fan control and 120 mm FDB (Fluid Dynamic Bearing) fan. The higher the level of efficiency of the power supply, the less power gets wasted in the form of excess heat . The 80 PLUS® Platinum certification guarantees greater than 90 %, 92 % and 89 % efficiency at 20 %, 50 % and 100 % operating loads, respectively. The Seasonic Platinum Series represents the highest level of technology and efficiency achievement of Sea Sonic during its 40 years of commitment to engineering excellence. The world-renowned Sanyo Denki ball bearing fans are made of the highest quality components to ensure ultra-low noise performance. The fan’s perfect balance and even rotations are achieved via the use of spoon-shaped, high-density plastic fan blades that are finished off with smoothed leading edges. Sanyo Denki fans are known for their strict tolerance ball bearings and precision copper axels. Instead of the industry standard of two balancing points they use three points to strengthen the mount and further stabilize the blade. Improved voltage regulation stays well within Intel’s specifications to ensure smooth operation and protect all system components.